On Saturday, May 5, 2018, the Franklin Humanities Institute – North Carolina Central Digital Humanities Initiative held its second annual symposium. Piloted over the 2016-2017 academic year, this Mellon Foundation-funded fellowship program, part of the multi-year grant Humanities Futures, provides funds and support for the increased use of digital technologies in the classroom. The program is coordinated at Duke by Victoria Szabo (Associate Research Professor of Art, Art History & Visual Studies; Director, FHI Digital Humanities Initiative) with assistance from Hannah Jacobs (Multimedia Analyst, Wired! Lab). This year Kathryn Wymer (Associate Professor of Language and Literature) served as faculty coordinator at NCCU, a role previously shared by Matthew Cook (Professor of Postcolonial and South Asian Studies) and Joshua Nadel (Associate Professor of History). The symposium kicked off with keynotes by two senior scholars at the intersections of African American Studies and Digital Humanities. Ronald Bailey (Department Head and Professor of African American Studies at the University of Illinois at Urbana-Champaign), noted that partnerships with historically black colleges and universities (HBCUs), most of which are located in the South, help to address inequities in digital publishing. In his presentation, "Mainstreaming and Mainstreaming the Study of the African American Experience: The Affordances of Digital Tools," he argued that equity and access initiatives should be an integral part of any digital humanities initiative, one example being his Mellon-funded initiative, AFRO Publishing Without Walls, which seeks to provide access and training for digital publishing tools to faculty and staff at HBCUs as well as other Black Studies scholars. This point was taken up by Gabrielle Foreman (Ned B. Allen Professor of English and Professor of History and Africana Studies at the University of Delaware) in her presentation, "Digital Organizing and Collective Recovery: Colored Conventions and the Long History of Black Activism." She focused on her experience directing the Colored Conventions Project, which shares the history of the collectives and collective action that, she argued, have always been central to black art and organizing. She also spoke about the ways in which the project seeks to dismantle the notion of proprietary knowledge and to hold itself accountable to the large number of team members and students who generate its research and ensure its accessibility. Following the keynotes, the seven 2017-2018 FHI-NCCU Digital Humanities Fellows delivered presentations on the ways in which they’d incorporated digital humanities pedagogies, methods, and tools into their teaching and research. Projects ranged from student video reflections on digitized primary sources related to the history of the black press, to an interactive StoryMap depicting the travels of key figures in the Afro-Atlantic Archives from the 16th to 20th centuries, to a digital library for professional artists and musicians seeking K-12 teaching opportunities. In her opening remarks, Victoria Szabo said, "When we began the Digital Humanities Initiatives at Duke three years ago, we started with ‘Conversations in the Digital Humanities,’ to take stock of where we were, digitally speaking, and to move us forward in terms of thinking about the future. 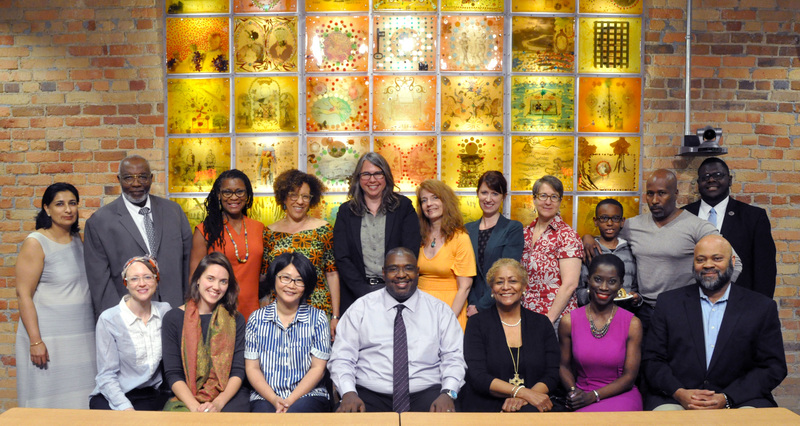 The FHI-NCCU Digital Humanities Fellows Program has been the best realization of that dream." Congratulations to the 2017-2018 FHI-NCCU Digital Humanities Fellows upon their completion of the program!